We know that Donna played at Henderson’s Theater on Coney Island earlier in the month. She then came to Pacy’s Garden Theatre in Baltimore, Maryland. 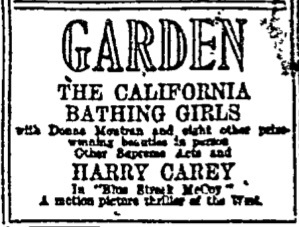 The “California Bathing Girls,” a group of eight from filmland, feature the bill in a costume and song sketch, “A Beach Promenade.” Other acts are…. We know the show moves on to Washington D.C., and the Cosmos Theater the following week. 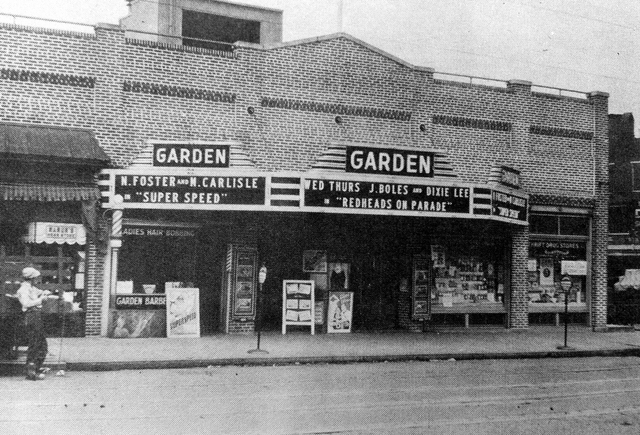 Not much is known about Pacy’s Garden Theater. Although the theater opened in 1912, it is not listed in The Julius Cahn Theatrical Guide 1913-1914. The Yearbook of Motion Pictures – 1926 indicates that the theater seated 600. Cinema Treasures indicate that the theater closed in 1960 and was demolished. [ii] Today it is a parking lot. [i] The Sun (Baltimore, Maryland – September 14, 1920,1920-09-14 – Page 8 – Garden ad. [ii] Cinema Treasures: Garden Theatre .